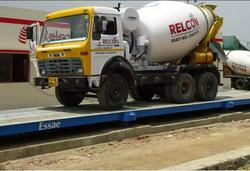 Essae Digitronics manufactures Electronic Truck Scales, popularly known as Weigh Bridges. A dedicated team for design, manufacture marketing, installation and servicing of electronic truck scales ensures impeccable focus and faster response to customer's needs. Essae Digitronics is able to offer world-class products to our valued customers. Our Tufdek Weigh Bridge offer higher strength, greater reliability and faster installation than conventional systems. Their simple foundations, fast, bolt-down sitting, and innovative box construction have made them the preferred choice of operators across the country. Fully welded modules using High Tensile welding wires offers rigidity to the platform. Modular Concept to offer easy installation, mobility, and platform extension. Raft foundation helps in the Low cost of ownership. The calibration and testing for each system are carried out prior to delivery. 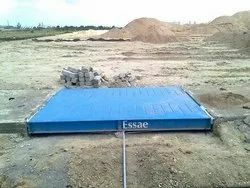 Owing to our expertise in this field, we are offering our clients a wide range of Portable Weighbridge. These Weigh Bridge are designed with high precision in order to meet all international quality standards. 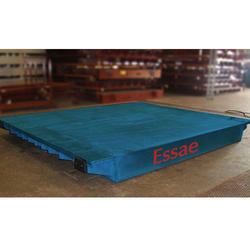 These Portable Weighbridges are highly appreciated among clients for their sturdy construction, dimensional accuracy, and longer service life. The offered pads can be availed by clients from us in various specifications as per the varied demands of clients. Uptime and accuracy are paramount importance to our customers. No other weighbridge manufacturer has processes in design, manufacture, testing, and service that can better Essays. 100 percent quality, 200 percent security. Before delivery, we assemble every weighbridge and put it through stringent check for accuracy and workability. 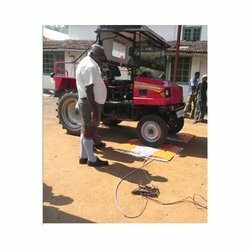 Utilization of Protective covering, NDT testing, plasma cutting, Shot impacting, MIG welding, Epoxy completing help in making additional nature of compact weighbridges without a doubt. The calibration and testing for each system are carried out. The weighbridge is not set up at the customer site unless we are completely satisfied with the test results. 1. Complete extent is less than 1 feet. 3. Hefty duty patterned deck plate. 5. Standard in construction that helps in simple transportation. Demands low or less maintenance. Ensure the optimum level of steady calibration and performance as load cells are scale-out to the final micro-volt. Dust, water, and allied elements have no impact on the functionality as it is secured to IP-68. Load cells are field proven and tested. Elevated security is provided and thus completely tamper-proof. Support handled and fabrication by the expert crew is available. Our steel and Truck Weigh Bridge decks offer higher strength, greater reliability and faster installation than conventional systems. Their simple foundations, fast, bolt-down sitting, and innovative box construction have made them the preferred choice of operators across the country. is carried out prior to delivery. Trucks with axle load higher than legal limits cause a disproportionately higher percentage of damage to the infrastructure and adverse impact on traffic safety. Our Company Toll Weighing System System is a robust, reliable, maintenance-free weighing mechanism designed for use on highway & Mines. 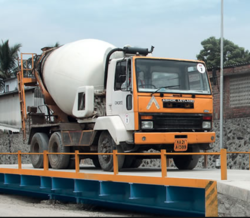 With the help of our well-trained professionals, our firm has been able to manufacture, supply and export Weighbridge, Road Weigh Bridge, In Motion Road Weighbridges, Off-Road Weighbridges. It is manufactured using high-grade raw materials incorporating the latest technology to ensure its quality. Offered bridge is suitable for measuring the weight of loaded or unloaded trucks and other means of transportation. We conduct different quality checks on our Weighbridge so that potential flaws can be easily eradicated and quality as per the industry laid norms can be assured. Below mentioned is the technology used for ensuring high reliability with an accuracy of the measurement system. The load cell assures long life due to its compact, simple design and rugged hermetically sealed construction. The advanced tension link mounting arrangement ensures reliability to weight measurement, smooth performance of the load cell high accuracy. Electronic weight indicator makes work cheaper, faster simpler and it's user-friendly. Leveraging on our nationwide marketing and supply chain, we are considered to be the international entity manufacturing and exporting a wide range of Mobile Axle Weigh Bridge. Integrated with an advanced software, these equipment have the ability to separately weight the each axle weight of the truck. Offered in different capacities, the entire range of Mobile Axle Weigh Bridge is offered to the clients at the reasonable prices. The data management unit has built-in software that records each axle weight separately and indicates the sum total of all the axles to get gross vehicle weight (GVW). Mobile Axle weighs bridges can weigh loads from 1-50 tons per axle. Portable Axle Weigh Bridges are useful for weighing GVW up to maximum 120 tons. Looking for Weigh Bridge ?